Once again may we remind you that the information provided below is about 4 weeks old, articles needed to be sent to the magazine’s editor by the 5th November for publication in December. Furthermore, since the last report, much has happened, been promised and hopes dashed. Nevertheless, we’ve attempted to present all the salient events. The most significant matter is the consideration of the Outline Planning Application (OPA) for the Frenchay Hospital site by South Gloucestershire Council’s (SGC) Development Control Committee (DCC). This meeting (which may have already taken place by the time you read this) is open to the public and it is essential that local people do their best to attend and thereby demonstrate to the Councillors their wish to see the OPA rejected and replaced with a more appropriate plan for Frenchay. What is wrong with the OPA? It is tempting to restate, yet again, the numerous shortcomings of the OPA but, instead, the chart below highlights the key features that make the plan unacceptable. Primarily, this is for the same reasons that SGC itself unanimously rejected the original Concept Statement (CS) in November 2012 and which local people profoundly disapproved of. In essence, the OPA is virtually indistinguishable from the CS, although some may consider it even inferior. May we also remind you that the OPA has been compiled without any consultation/engagement from local residents. Thus the OPA was submitted on 14th December 2012 and has, thereafter, been the subject of an exclusive process between North Bristol Health Trust’s agents, GVA Grimley, and SGC planning department. We simply cannot understand why a Community Board has not been created so local residents can help/participate in the development of the plan. This is in complete violation of the spirit of the Localism Act, which calls for local people to share in the planning process of developments where they live. However, it seems entirely likely that the much admired, and indeed loved, Lime Tree Avenue will not be felled, as included in the OPA. As you may remember from earlier reports, RUG privately commissioned two tree specialists to survey the condition of the avenue’s trees. Both concluded that, provided they were properly managed in the future, the effects of the poor maintenance of the past could be reversed and they would last for many decades, probably another 150-200 years, so saving this national asset for future generations to enjoy whilst maintaining the principal route and setting to Frenchay Park House. We have three very important issues we need to share with you plus some good news regarding Lime Tree Avenue (LTA). As you will hopefully remember from last month’s report, two members of RUG held an initial meeting with Mike Coupe, Director for Strategy and Planning, at North Bristol NHS Trust (NBHT), in early September at which it was agreed to meet again to discuss the principal issues raised by residents, such as the density of housing proposed, the community hospital, protection of all green open spaces, etc. This second meeting took place at Southmead Hospital, on Monday 30th September, hosted by Mike Coupe, NBHT also being represented by Peter Rilett (Chairman of the Board), Phil Morgan (Project Manager, Southmead & Frenchay) and Jo Davis (GVA). Those representing RUG were Mike Pick, Bob Woodward and Alan Jocelyn. When LTA was discussed, Mr Rilett, said that the felling of the trees was a request from South Gloucestershire Council (SGC), not NBHT. However, RUG pointed out that their Outline Planning Application (OPA) did not mention this but showed the Avenue removed and taken into building land. After some debate, NBHT said it would alter its OPA, removing this item, so saving this national asset and acknowledging the wishes of residents for its retention. This is great news but, at the time of writing, RUG has not seen, nor been told of, an amended plan. Regarding the OPA, some residents may be aware that SGC has to make a decision to accept, or reject, the application within a specified time frame and it seems likely that there is little time left for this, in which respect we understand there is to be a special meeting of the Development Control Committee (DCC), some of whom visited the Hospital site on Friday 13th September, probably in early November at the Council’s offices in Kingswood. Because of the shortage of time, RUG believes the OPA process should be frozen by NBHT, something SGC cannot do, and negotiations with RUG, representing local residents, started in earnest. However, until this position is reached, and NBHT acknowledges that residents have the right, under the Localism Act, to contribute to the design of developments that affect them, we need to ask your further help by being prepared, perhaps at short notice, to attend the DCC meeting and demonstrate Frenchay’s united determination for the inappropriate OPA to be rejected. The other important issue is that of the Town & Village Green (T&VG) status application. As expected, NBHT has formally objected to the T&VG and appointed a barrister to challenge our application from whom we have received a 191 page dossier and are currently putting together a response. However, at a meeting of SGC’s Public Rights of Way and Commons Registration Sub-Committee, on Thursday, 19th September, it was decided that the T&VG application should be resolved by a Non Statutory Public Inquiry, an outcome RUG was hoping for. SGC are responsible for organising the Public Inquiry and RUG will, of course, keep you in touch as the process progresses. However, please be prepared, once again, to support RUG and the T&VG application, as appropriate. The determination of the T&VG application will probably now be delayed until sometime between late November and March/April 2014 and the impact that this will/might have on progressing the OPA and the disposal of the site is unknown but we feel it is imperative that we pursue this in the hope of retaining as much of the Frenchay Parkland as possible for future generations. In October last year, it was announced that a review was to be undertaken regarding the provision of health care across North Somerset, Bristol and South Gloucestershire and this would impact on the Community Hospital (CH) at Frenchay and that the results would be available in the spring of 0f 2013. In April/May this year, after months of deep concern over the future of the CH, the newly created South Gloucestershire Clinical Commissioning Group (SGCCG), which is now responsible for the proposed Hospital, declared that it would only commission 68 beds within a private health facility at Frenchay that would also include elderly care beds. It further proposed that outpatients and diagnostics could be provided at Cossham Hospital and Yate Health Centre. In our view this is not the Community Hospital we were promised and need. Furthermore, a GP surgery, which would be very popular in the village, has not been mentioned. This information will come as a great disappointment to the people of Frenchay and RUG plans to discuss the issues with local MPs in the hope they will ask the CCG to review, and alter, their plans. Hence, on behalf of residents, RUG has approached a company with specific expertise in developing sensitive sites, such as those in, or adjacent to, conservation areas. Our intention is to introduce the developer to NBHT in the hope that a deal can be reached whereby a single company purchases the site and that that company enters into a legal agreement embracing the wishes of local people. If the above starts to bear fruit, RUG would call a Village meeting where residents would be introduced to the company and, at last, the moral and legal rights of residents to influence the redevelopment of the Hospital site would be publicly acknowledged with the initiation of a Community Board within which both residents and the developer would work together to fulfil the original concept of creating a ‘lasting legacy for Frenchay that all, now and in the future, will admire and enjoy’. Since the ‘Our Village’ meeting in the Flower Show marquee on 21st July, the number of RUG supporters has, at the time of writing, 9th September, risen to 1084, with more mandate forms arriving daily. The RUG Committee is very grateful for this support whilst, at the same time, being very conscious of the responsibility it has taken on. We are also very grateful to all those who wrote to South Gloucestershire Council (SGC) requesting rejection of the Outline Planning Application (OPA), also known as the New Master Plan. We know that at least 550 letters were sent, this being 500 more than those objecting to the Concept Statement of August 2012 – what a difference a year can make! 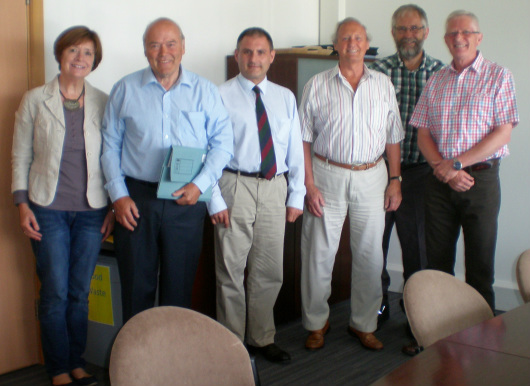 In early September, two RUG members met with Mike Coupe, Director for Strategy and Planning, at NBHT. At the meeting, a delay of six weeks in the SGC planning process for the OPA was requested which, with the support of the Chair and Chief Executive Officer of the NBHT has been accepted. This extra time will allow two independent studies of Lime Tree Avenue to be carried out, one by a national company of tree specialists Bartlett Tree Experts, founded in 1907, the other by a renowned UK expert, used by Kew Gardens and Westonbirt Arboretum, Alan Engley. In addition, RUG has also organised a new study of traffic movements in Frenchay, all these studies being generously funded by Frenchay residents. We hope the results of these investigations will be known by mid October at the latest. On Friday, 13th September, a sub-committee of the Development Control Committee from SGC will be touring the Hospital site. This is usual practice to help them understand the OPA more fully and, ultimately, as a precursor to deciding whether, or not, to accept the application. RUG will be allowed a short presentation at which the fact that there has been NO meaningful consultation/engagement with residents since before the OPA was submitted on 14th December 2012 will be our key message. Furthermore, it is quite clear that simply telling people that a planning application can be found on a web site or, alternatively, reading a paper copy in Frenchay Museum, open on three afternoons a week, is NOT consulting with residents. Thus, there are immense computer difficulties in navigating a path to the application on the SGC web site, where there are currently 855 documents listed to potentially be opened, which is clearly unrealistic and unfair. RUG has been arguing for months that a model/exhibition of the massive and complex development should be made available, perhaps for two hours in the evening every two weeks, in our Village Hall, with experts from SGC or NBHT there to explain the plan, its detail, ramifications, timescales etc and, most importantly, to answer questions and take ideas and concerns back to the designers. We still hope, even at this late stage, that NBHT will recognise the moral and legal rights of residents to influence change within their community and initiate a Community Board within which both RUG and GVA can work together to fulfil the original concept of creating a ‘lasting legacy for Frenchay that all, now and in the future, will admire and enjoy’. If you would like any more information please contact any of the RUG committee members listed below. Since February this year, when many local people sent comments to South Gloucestershire Council (SGC) regarding the inappropriateness of the Outline Planning Application (OPA) that GVA/NBHT submitted to SGC on the 14th December 2012, Frenchay residents have not been invited to help develop/steer the plan, despite several requests from RUG to be involved. This long gap of virtual silence has now been broken and, on the 16th July, the OPA, now renamed the New Master Plan (NMP), was published by SGC but with a request for responses by 6th August. Regrettably, by the time the plan appeared on the SGC web site, which was the 22nd July, just 15 days remained for such responses, and during the busiest holiday period of the year. However, RUG, with the help of many residents, together with our MP, Jack Lopresti, persuaded SGC to extend this to 31st August, thus giving 6 weeks for comments. Nevertheless, it seems, to RUG, a pity that GVA/NBHT/SGC have not invited local residents to participate in their plans, perhaps by creating a Community Board, and thereby gain a genuine understanding of residents’ concerns/fears, and also benefit from local knowledge and well-meant ideas. New school mainly for new estate children. What about extending current School, so all children can attend a ‘Village school’? No community hub/facilities such as shop(s), GP surgery, or communal buildings as originally deemed essential and promised. Why are these not being provided? Felling, narrowing and replanting of established, historical, Lime Tree Avenue at a cost of approx. £250,000, yet life of these trees measured in 100’s of years. Why is this being proposed? The NMP is an incomplete plan without confirmation of the future of the promised Community Hospital and Listed buildings (i.e. contracts signed and start dates announced). Furthermore, the Elgar wards at Southmead are to be refurbished as a community hospital whilst our Community Hospital is on hold, will it ever materialise?. Without it, more houses! At the meeting, RUG asked local residents for a mandate to be sure that they are really comfortable for RUG to represent them and I am delighted to say that, at the time of writing, 706 have written in support of RUG, a number that might reach 1000 by 1st September, for which members of RUG are very grateful. SGC is going to request the ‘Development Control (West) Sites Inspection Sub Committee’ to judge the NMP on, either the 13th September or, more likely, the 24th October. 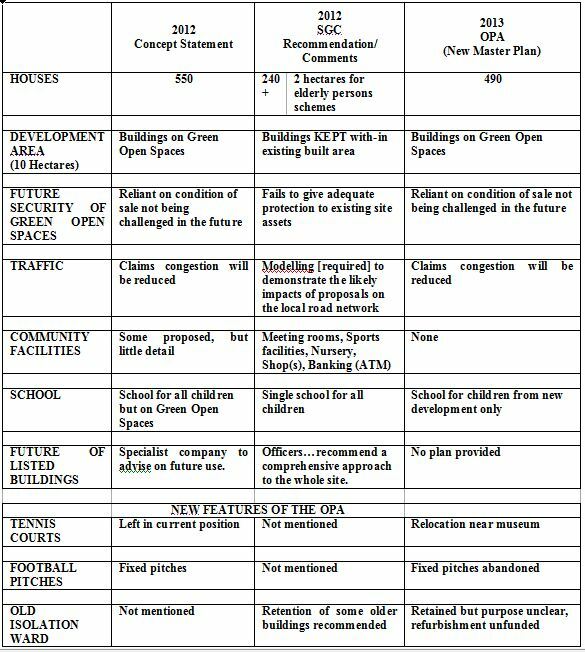 Hence, RUG is currently trying to provide as much information as possible about the NMP to help those who wish to write to SGC about the plan and, perhaps most importantly of all, trying to develop a ‘village plan/alternative vision’ – a process in which we are very keen that local residents participate. Finally, RUG has commissioned three specialist arboriculturists to report on the condition and, in particular, life expectancy, of the trees in Lime Tree Avenue. We will report their findings, hopefully, in the next few weeks. As you will see from the above title, this is RUG’s twelfth report, and thus, after communicating to residents for a whole year, it seems appropriate to reflect on what has happened over this period. In fact, the plan for the future development of the Frenchay Hospital site started nearly 2 years ago with the appointment of planning consultants, GVA Grimley (GVA), on 14th September 2011 by North Bristol Health Trust (NBHT). In addition to the above, the specific number of 350 houses was shown, on their PowerPoint presentation, which was perceived by many as a ‘starting number’ and which, in the end, might reduce to between 250-300. However, the number of houses quickly rose to 550, currently stands at 490, without any convincing guarantee that existing green open spaces would not be built on in the future, which would further increase this number. Furthermore, no architectural details have been presented showing what the new houses might actually look like. Although this is not a legal requirement of GVA at this stage, one principal reason for the unanimous rejection, in November 2012, by South Gloucestershire Council’s (SGC) Planning Committee of the original Concept Statement (CS) was because they couldn’t make a judgement on a housing development scheme without seeing the overall design of the proposed houses. It is still puzzling why so much good advice by SGC Senior Planners, who analysed the CS so thoroughly, and responded so creatively, has not been acted upon. In addition, the latest plan indicates that no community facilities are to be built to help secure community cohesion, and there has been no consultation with the community since the meeting in the Jubilee Room of the Village Hall on 3rd & 4th October 2012. From the above, it is difficult to avoid the conclusion that the priority of NBHT is to raise as much money as possible and that GVA feel this would be best achieved by building as many houses as possible on the site. However, if this is the case, it seems possible to us that there are other means of raising a similar amount of revenue but in ways that would be more acceptable to the community, such as building a smaller number of houses, but including ones of distinction, and/or by setting up a retirement village. RUG, therefore, recommends a new plan is drawn up with which residents of Frenchay are invited to play an active role. RUG has three items of importance to share with residents. After waiting for nearly six months for any formal information regarding GVA Grimley’s Outline Planning Application (OPA), which was submitted to South Gloucestershire Council (SGC) on 14th December 2012, I can now tell residents that Rob Nicholson, SGC, has informed RUG that a new/replacement master plan has been produced. In effect, this will be the third plan for the hospital site: Concept Statement autumn 2012, OPA(1) winter 2012 and now OPA(2) summer 2013. Firstly, unfortunately, the details of OPA(2) will not be known until after this article has gone to print. However, the Chair of the Frenchay Preservation Society (FPS), Paul Kembery, has kindly arranged for me to talk on the evening of 20th June at the half yearly meeting of the FPS, by which time details should be available. Also, at the Frenchay Flower Show, 20th July, RUG is hoping to have a small stand/facility where residents can discuss the OPA(2) and, hopefully, view the proposed plan. Secondly, a Frenchay Community website has recently been launched and, hopefully, RUG reports will be available to view there as well as on the FPS website. This is particularly useful as Mike Hardeley has kindly offered to set up an initiative to try and establish what community facilities residents would like to see included in OPA(2). To this end, Mike is in the process of compiling a questionnaire which RUG will make available on paper and electronically. The questionnaire is important as it is another chance for the community to let SGC know what it, collectively, wants to see as regards the development of the site. RUG hopes that many residents will participate in this consultation thus making it as comprehensive as possible. If you do not have internet access, a paper questionnaire can be obtained from, and subsequently returned to, a RUG member, as listed below. Finally, the Village Green Status application is progressing within SGC. We understand that formal notice of the application will be signed on 12th June after which it will be published in the press, posted up on site and served, in accordance with the statutory requirements, by the 10th July, to the owners of the land, North Bristol Health Trust. The period within which any objections can be made will end on 23rd August. However, it seems likely that NBHT/GVA will informally already know of the application. As mentioned last month, an application for all open spaces within the Hospital site to be granted Village Green Status (VGS) was, on the 11th April, hand carried to South Gloucestershire Council (SGC). The proposed VGS application covers a broad swathe of land starting at the back of Tanners Court, flowing easterly behind Malmains Drive and Homestead Gardens, then turning southerly behind Cedar Hall, Frenchay House, Clarendon House and The Old House, around Frenchay Park House (NBHT HQ) and joining the helicopter landing site and cricket pitch right up to Begbrook Park and the Frenchay Village Museum. The return of the land to ‘park land’ abuts a large number of detached hospital buildings known as the ‘built line’, this very useful boundary having been defined by SGC senior planners in 2012. The area consists of conservation land, areas/copses covered by Tree Preservation Orders (TPOs), individual trees protected by TPOs, a Nature Reserve and all spaces in between. Hence, if successful, the VGS would provide an unbroken ‘greenbelt’ for about one half of the circumferential boundary of the proposed development, a wonderful environment both for new and existing residents. However, the law allowing local people to apply for VGS has, in effect, been withdrawn with the new Growth and Infrastructure Bill, which received Royal assent on 25th April. The new law prevents an application for a VGS being made “when an application for planning permission has been made or granted, and when land has been allocated for development by the local authority”. It was thus essential that the complex, and lengthy, application had to be submitted and accepted as having met comprehensive criteria before the 25th April. I am happy to be able to report that confirmation that the application was acceptable was received from SGC on 26th April. The owners of the land have been advised of the application and may decide to challenge it. If this happens, a special Committee will be setup by SGC, possibly culminating in a lengthy public inquiry involving the NBHT and the residents of Frenchay. All of this has come about because, despite many requests that all open spaces are spared from development but, instead, are gifted to the people of Frenchay and subsequently maintained by SGC, no reassurance on this matter has been given. However, the preservation of the open spaces is only one of many concerns voiced by residents in letters to Rob Nicholson regarding GVA’s Outline Planning Application. To help prioritise these the chart below has been produced. RUG is currently planning the best way to respond to these concerns. He also thought RUG’s “very detailed” response to the OPA, sent during the consultation process, would be difficult to expand upon and thus a meeting unnecessary at this time. Electronic copies of the RUG report are available on the Frenchay Preservation Society’s web site: mail@frenchaypreservation.info or from any of the committee members. Furthermore, we have been advised that South Gloucestershire’s Clinical Commissioning Group (CCG) will be publishing its long awaited report on Frenchay Health and Social Care Centre in mid April. Presumably, the future of the much desired Frenchay Community Hospital will be known then and, thus, the impact on the overall site. In the meantime, concern over the future of the Hospital’s open spaces remains. RUG’s understanding is that the current plan is to sell the whole site, which would include land for building and open spaces. It is quite possible that more than one developer may acquire the site, in the form of ‘parcels of land’, each containing an area for building and some open space, causing concern that ‘development creep’ will occur and that much of the open space will be built on. Despite many requests that all open spaces are spared from development but, instead, are gifted to the people of Frenchay and subsequently maintained by SGC, no reassurance on this matter has been given. As a result, an application for all such spaces within the Hospital site to be granted Village Green Status has been submitted to SGC. If successful, this will eliminate any chance of this precious land being developed. There has been a significant response from Frenchay residents to the Outline Planning Application (OPA), ref: no PT13/0002/0, submitted by GVA Grimley on behalf of their client, North Bristol Health Trust (NBHT), to South Gloucestershire Council (SGC), the closing date for responses being 15th February. We are very grateful to those who provided copies of their submissions, which have been of great help in understanding local peoples’ views. RUG has been in regular contact with Rob Nicholson and, at the time of writing, we await his response regarding SGC’s initial thoughts. However, GVA may submit a modified plan, even before the full process of evaluation of the OPA is complete, in which case, residents are likely to be asked to comment on yet another plan. However, it is reasonable to expect that any further plan(s) from GVA are likely to be similar to the unpopular ones they have already produced. Hence, RUG has been considering the next stage of the planning process and believes that the community might be given an opportunity by SGC to take a more proactive role in formulating the development proposals for the site. If given such an opportunity it would enable the community to play a part in shaping certain aspects of the development and to put forward its collective view on an alternative "vision" for the site as long as this is realistic and deliverable in planning terms. It is too early to say if SGC will adopt this approach to the OPA but, in anticipation of it doing so, RUG is considering the best ways of approaching local stakeholders, and Frenchay residents to put together plans that truly represent the collective aspirations of the community. In the meantime RUG will do its best to continue to liaise with SGC, keep residents informed of the progress of the OPA, and try to secure the community’s involvement in the process. 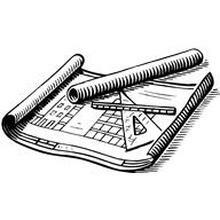 Finally, many residents will have recently received another white card entitled TOWN AND COUNTRY PLANNING ACTS NOTIFICATION OF APPLICATION, application no PT/13/0393/LB, advising of the ‘Demolition of Pre-1948 hospital buildings’. However, there are those who feel that the retention of one, or two, buildings of pre-1948 stock would be of historical importance and we understand that the matter is being considered by SGC. Rob Nicholson has also suggested that the above application will be considered when assessing the OPA. In February’s report, we were able to tell you that, although GVA Grimley’s (GVA) Concept Statement (CS), submitted to South Gloucestershire Council (SGC), had been unanimously rejected by the Planning, Transport and Strategic Environment committee of the Council on the 28th November 2012, GVA had, on 14th December, submitted an Outline Planning Application (OPA) to SGC based principally on the rejected CS. 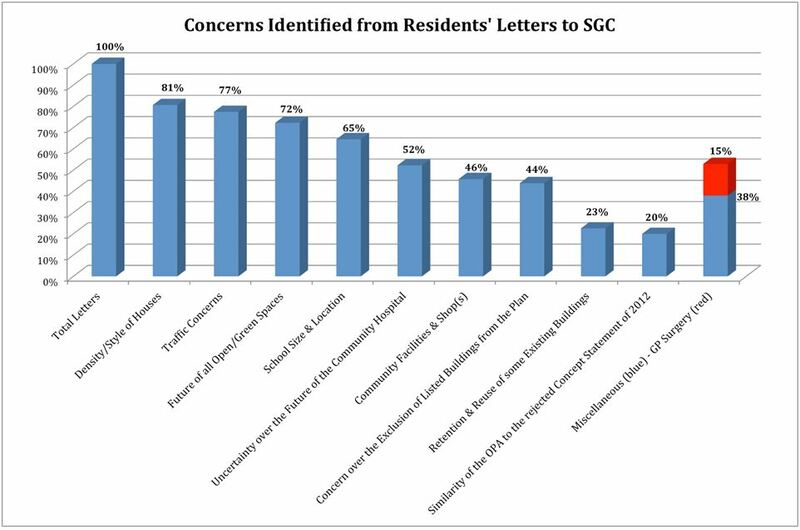 Subsequently, and mainly during the second week of January, SGC sent residents a white card entitled TOWN AND COUNTRY PLANNING ACTS NOTIFICATION OF APPLICATION. The card invited recipients to comment on the OPA but these had to be submitted to SGC by 25th January. With no public consultation/exhibition, residents had to rely mainly on the SGC web site to view the OPA or, travel to the Councils ‘one stop shop offices’, in the snow! Both accessing the OPA on line, and viewing its content on a computer, is not possible for all, nor is the medium particularly suitable. Furthermore, comments were required by 25th January, little more than two weeks from receiving the ‘notification of application’ card. Happily, Robert Nicholson of the Major Sites Team Planning and Environment at SGC, who is responsible for assessing the OPA, extended the time to respond to Friday 15th February, at the request of RUG, which also allowed time for the ‘green flyer’ to be produced and distributed. 6) The foolishness of making a decision when the future, size and location of the Community Hospital is uncertain. Finally, we are delighted to tell you that three new volunteers have joined RUG, Mary Ryan, Jane Goram and Paul Green. Subsequently, we now have an even broader group to help us protect Frenchay from inappropriate development, whilst improving communications to and from residents. Many, including RUG, hoped that the rejection of GVA’s plan would prompt the generation of a new CS. However, on the 14th December, GVA submitted an Outline Planning Application (OPA) to SGC based principally on the rejected CS. The decision to submit the OPA so quickly after the dismissal of the CS comes as a great disappointment to RUG and, we suspect, to most residents. It would appear that, although the Concept Statement process is intended to establish the ‘principles on which a planning application is designed’, it is not a mandatory requirement. In fact, it may be that there are only a few Councils, South Gloucestershire being one, who do, indeed, use them at the preliminary stage of a formal planning process. I should add that, although RUG was set up as a conduit for information between GVA/NBHT and residents of Frenchay, GVA did not advise us of the submission of the OPA nor were the Frenchay Preservation Society and our Parish Councillors informed. RUG is already in contact with the Senior Planning Office at SGC who is the principal contact for the OPA, Robert Nicholson. In addition, we are trying to identify the most effective way to consult with residents on the relevant details of the OPA and to try and find a way to enable residents to help shape the development proposals. In the meantime, if residents wish to respond to the OPA they should write to SGC, the closing date for responses is Friday 15th February. As before, RUG would be very grateful for a copy of any communication, so please contact any member, preferably by email, so that we can correlate responses. The Residents User Group (RUG) of Frenchay would like, firstly, to publicly thank the Planning, Transport and Strategic Environment committee (PTSE) for this opportunity to comment on the proposed development of the Frenchay Hospital site, as described in GVA Grimley’s Concept Statement. RUG understands the need to develop the site and is, indeed, very excited about the potential improvements to Frenchay that the correct development could bring. It also understands the need to raise the maximum value from the site for reinvestment into health care. However, RUG realises the very profound need to establish, at this critical stage, the planning principles which will guide subsequent contractors who will actually carry out the development of the site. Thus, RUG fears the ramifications of ‘not getting it right’ which could result in lengthy battles with one, or possibly many, contractors or even the spoiling of Frenchay. We know that SGC are aware of the above concerns and that its planning officers have stated that the Concept Statement, as submitted, is flawed and, in their view, should not be endorsed with or without amendment. RUG would like to thank the Officers involved for their intelligent report and the manner in which they engaged with the residents of Frenchay, and thus concludes that the Officers judgment is correct and hopes that this committee will not endorse the Concept Statement. However, RUG would be delighted to work with GVA/NBHT, any other interested party and, of course, SGC, on a plan that is more appropriate for the community. Hence, we must get it right for the future. At the end of November, our RUG colleague Alan Smith died. We would like to take this opportunity to express our most sincere condolences to his wife and family, he will be sadly missed.